Elizabeth Brown Maternity News - Posts of interest, new product launches..
Today’s the final day of the Baby Show at ExCeL London. We’ve spoken to so many lovely people and received some great feedback. The Maternity Fashion Show was a big hit, with our Bodycon Dress almost selling out within the first half of Saturday. Our new range, including the CrossoverDress, Bodycon Dress, Maternity Jogger’s, You&Me Top Set and the Ivory Lace Top Set will be available to purchase online from Monday. The Baby Show – Back Again! This March, Elizabeth Brown Maternity will be at The Baby Show at ExCeL in London. This is our second trade event and will be even bigger and better than before. We will have more stock available than before for you to choose and a private changing room so you can try before you buy. Our friendly staff are on hand should you have any questions. So you can see it, try it and love it! – Last time we had customers wearing our clothes when they left. We can be found at stand G33. Each day there will be a variety of events provided by The Baby Show and their sponsors, from practical parenting tips to fashion tips. Several of our garments will be displayed in the Maternity & Baby Fashion Show, which will take place every day. As an exhibitor, we can offer our customers an exclusive ticket discount worth up to 35%. Simply enter code ‘EBMATERNITY‘ to receive your discount. 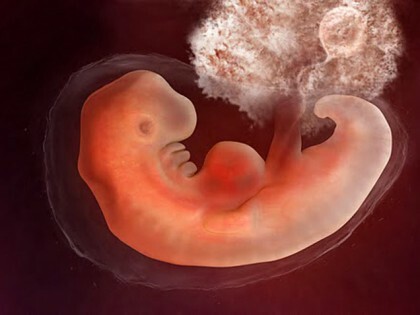 At 5 weeks pregnant your baby is around 5mm and the size of an orange seed. Your baby may resemble a tadpole this week, but his arms and legs are already starting to show in the form of little buds. This week is very important for brain development as your baby’s cells are developing into the neural tube which will become their spinal column and their brain. SO make sure you are taking folic acid. By now your period will be officially late and you may feel all over the place. Your hormones will be raging as your levels of estrogen increase to help keep up the levels of progesterone and HCG. Progesterone is there to help maintain the placenta and help stimulate breast tissue growth. HCG is a hormone that supports the corpus luteum which nourishes the baby until the placenta kicks in which is usually around 10 weeks. With all these new hormones flying around, it’s perfectly normal to feel very emotional. So do not watch a soppy film, or a soppy advert unless you have a box of tissues ready! You will also notice this week that your breasts may start to feel heavy and uncomfortable or you may have back ache or mild cramps. Try a warm bath to relieve them but if they become a problem please see your GP. When to spread the news? You may want to run around screaming it from the roof tops, or you may wish to keep it quite as long as possible, everyone is different. But you may want to discuss it with your partner when you feel would be the best time and who to tell. The last thing you want is for your partner to run telling their friends and family if you wanted to keep it hush hush. If you don’t have a partner, then find a close friend or family member to talk to. Pregnancy is a very emotional time so it’s a good idea to have someone to talk everything through with, even if it is just baby names! Congratulations! You may have just found out the exciting news that you’re going to have a baby! This can be rather a rather confusing time trying to work out dates and what are the next steps you should take. Over the next few months we will be posting a week by week guide to your pregnancy, what to expect, things to think about and what your baby will be doing so keep an eye on our blog. Has that little + sign come up, or 2 little lines? Then congratulations! By the time you find out you are pregnant your baby is already the size of a poppy seed and is quickly making a comfy home for themselves. At this time you are already considered to be 4 weeks pregnant as your dates are calculated by the first day of your last period. If your periods are irregular then speak to your GP to work out your dates. Around 6-12 days after fertilisation, your growing placenta begins releasing the hormone HCG which is what will make your pregnancy test show up positive and can cause nausea and vomiting called morning sickness. You may feel as though your period is still due if you are experiencing stomach cramps and sore breasts but this is very normal. As the fertilised egg implants into the uterine wall and the placenta begins to grow, you may get some cramping and occasionally spotting which is perfectly normal but can still be a little worrying. If you are concerned at all then please see your doctor. Your body is already working hard as the amniotic fluid is already forming inside the sac which will help to protect your baby over the next 9 months. Your breasts are already changing and preparing for the birth of your baby and the production of milk. With all this hard work and new hormones racing, you can expect to feel a little tired and emotional. Booking a GP appointment – they will refer you to the hospital or birthing centre of your choice and the midwives will then be in touch. system and helps reduce the risk of spina bifida. Vitamin D can also be helpful during pregnancy and while breastfeeding as your levels can drop. Quitting smoking – if you smoke you may want to look at cutting back or stopping smoking. Smoking during pregnancy can cause premature labour or can restrict baby’s growth. It is worth discussing this with your GP at your first appointment. Cutting down or giving up alcohol – a lot of us love a glass of wine on a night out or after a long hard day, but alcohol can cause problems with the baby’s development with issues such as facial abnormalities or learning difficulties. It is advised that the worse time for drinking is within the first 3 months while the baby is developing the quickest and can potentially cause a miscarriage. Reducing consumption of caffeine – it is suggested you have no more than 200mg of caffeine a day. So try switching to caffeine free coffee or tea, or swap to fruit juice instead. If you’re pregnant you’ve probably heard of raspberry leaf tea, but is it really safe and does it really work? Raspberry leaf tea is made from the leaves of the raspberry plant and dates back to the sixth century. It has been taken by many women over the years for all sorts of ailments including high blood pressure, diarrhea, cold sores, sore throat, the list continues! But why is it used so often during pregnancy? Raspberry leaf tea contains many vitamins and minerals, most of which the uterus requires to function properly. A healthy uterus = healthy Mummy. The main vitamins included are C, E, A, B and minerals like magnesium, zinc and iron. A study pub lished in the Journal of Midwifery and Women’s Health in 2001 found that women who drunk raspberry leaf tea had shorter labours and there were fewer complications and interventions during birth. Raspberry leaf tea can be taken before and during your whole pregnancy but it has now been advised not to take it until your third trimester. If you do wish to start drinking it earlier then please check with your doctor or midwife before doing so. Helps reduce morning sickness – let’s face it, if you suffer from it then any relief would be good! Strengthen the uterus wall – this is by far the most important reason for so many women drinking the tea or taking the tablets. Raspberry leaf tea contains fragrine which helps to strengthen the muscles of the uterus which is believed to help with the second stage of labour. With increased vitamins and minerals, it can also help to promote the production of breastmilk. Doctors recommend you start by drinking 1 cup a day from about 32 weeks of pregnancy. You can then slowly increase to 2 cups after a few weeks and then up to 3 cups. The tea can be made and frozen into ice cubes for the summer. There are also tablets that you can buy from most heath food shops If you hate the taste. For recommended dosage please read the label. But raspberry leaf tea isn’t for everyone and should not be used in some cases. If you are overdue as it can cause intense contractions which could distress baby. There is not much research on the side effects but what is shown is that most women can tolerate raspberry leaf tea well with little or no side effects. If you do they are likely to be nausea, loose stools and increased Braxton hicks. If this is the case then please stop taking it. Our last point sounds simple but please, please make sure that you buy your tea from a reputable place. There are reduced regulations for herbal medicines and you want to make sure that there are no other substances mixed in with the tea or tablets. Drink, drink drink! It’s essential to keep your fluid levels up while you’re pregnant, and even more so during the warmer months. Remember to drink regularly as when you’re thirsty, you’re already dehydrated, leaving you feeling dizzy, tired and faint. To help avoid this take a bottle of water with you when you go out and about and keep always keep a glass handy at home. Stay indoors when possible. It may be frustrating being stuck indoors, but when the temperature is high you are at huge risk of heat stroke if you go out in the midday sun. If you need to go out try and go in the morning or after 2pm. But staying indoors doesn’t have to be a bore, why not give yourself a manicure, or do a bit of online shopping. Have a look at nursery ideas, or baby names, or even better, treat yourself! Have a look at our new vest tops to help keep you cool. Invest in a fan, both big and small – You can buy a hand held fan from the pound shop, which is great to keep in your handbag for when you’re out. But get a larger fan to keep in the house for when the heat gets too much. Use cold flannels on your face, neck and wrists when you get too hot. Buy a sun hat and suntan lotion. It may sound obvious but the last thing you want while pregnant is sunburn. Your skin changes when pregnant so you may be more prone to burning. Make sure to apply suntan lotion approximately 30 minutes before you go out and wear a hat to help keep the sun off your head. Being pregnant doesn’t mean you can’t enjoy the sunshine, but make sure you’re sensible. Becoming dehydrated or suffering from heatstroke can be extremely dangerous, so follow our tips to ensure you have a fabulous summer! Are you super organised and have packed and rechecked your hospital bag at 30 weeks? Or have you reached 36 weeks with no clue what to pack? Whatever stage you’re at have a look at our list of items to be included to ensure you’re not missing that one thing you wished you’d had. Firstly the bag. Don’t have anything that’s too big as you don’t want to leave your poor birthing partner lugging a huge suitcase or 4 bags around the delivery suit corridors. So unless you know you’re in for a lengthy stay keep your luggage to a minimum. Some women opt for 2 bags, one for herself and one for the baby which can help to keep you organised, save rooting through night dresses and maternity pads to find more nappies at 2am. But if decide to have one bag think carefully about the layout. Choose a holdall that’s big enough to put your items on one side and the babies on the other making life a little easier. Something to wear during labour – although the hospital will provide a gown, which you will have to change in to if you have an epidural or a cesarean section, you may feel more comfortable in your own clothes during labour. Choose an old nightie or a baggy T-shirt that you don’t mind getting dirty. If you are having a water birth then a bikini top works well. Snacks – You may be in labour for a good few hours and may need a boost to help you though. Pack things like flapjacks, multigrain bars, bananas to keep you going. You may want to pack bottles of drink and snacks for your partner. Nursing bras and pads – Pack at least 2, good fitting nursing bras. If you don’t intend on breastfeeding then you will still need the breast pads. Maternity pads – For after the birth, although thick, night time sanitary towels will work just as well. Extras you may wish to include: Mobile phone and charger, fluffy socks, lip balm, hair tie and hair brush, make up, disposable knickers, lanolin cream, a pillow, a blanket, a list of family and friends to call when baby makes an appearance, empty carrier bags to take home dirty clothes, massage oil, birthing ball. At least 2 outfits for the baby: Although you may wish to dress your baby up in gorgeous outfits, it’s often best to choose vests and sleepsuits for the first few days. Scratch mittens are also very useful as babies nails are often very long after birth and they have a tendency of scratching their face. Nappies and cotton wool: It is often recommend to use cotton wool and water instead of baby wipes as a newborns skin is very sensitive. Aim for changing your baby about every 2-4hrs so ensure you have enough nappies, although the hospital will have extra if necessary. Bottles and formula: if you plan to bottle feed your baby your hospital may request you bring your own bottles and formula. It can be easier to buy the readymade cartons of formula for your stay in hospital so you do not have to worry about boiling water and mixing the powder. A blanket or shawl and a cardigan or coat for bringing the baby home in, depending on the weather. If there is anything else you think you might need then don’t be afraid to pack it. It’s better than sitting in the hospital wishing you had it, or sending your partner on a midnight dash home to fetch it! It’s been a great night here at the Kent Women in Business Awards 2016. We’ve met some really fab people and heard some inspiration stories from other finalists. The winner of the Women in Retail category is our very own KERRY BROWN of Elizabeth Brown Maternity. A massive congratulations to Kerry. Since the launch in September 2014, Elizabeth Brown Maternity has been at the Baby Show, Bluewater found in numerous mother and baby magazines, supported our favourite charity Kicks Count, nominated finalist at both Mumpreneur Awards and Prima Baby Awards… and now here, winner of the Kent Women in Business Awards 2016. Thank you to everyone for your wonderful support and custom. Elizabeth Brown Maternity have been put forward to this year’s Kent Women in Business Awards. We are so pleased to be a finalist in the Women in Retail category. The award ceremony is tonight and we are here at the event. Keep watching or social media feeds for news updates as the night unfolds.